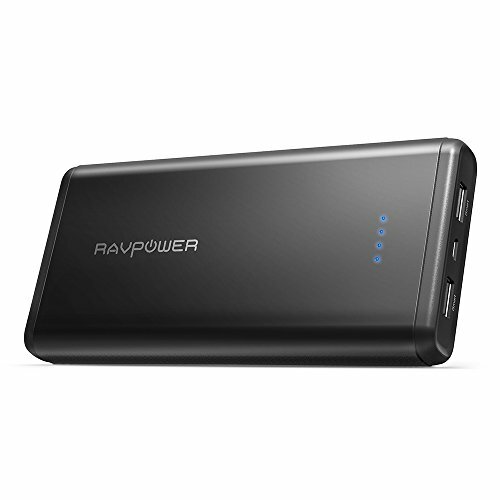 Travel safely and with plenty of power when using the RAVPower 20000mAh Portable Charger. With an 74Wh rating, it can be packed in your carry-on luggage onboard a domestic or international flight. For a huge output and for devices to quickly power up, enjoy a combined 5V/3.4A output that meets the needs of smartphones and tablets. Each of the two iSmart ports provides the optimized charging experience for your device while allowing 5V/2.4A output per port. Nobody likes waiting around to recharge their portable charger. When using a 2A or 2.4A adapter, the power bank recharges in a speedy 9 to 10 hours. That means you are saving at least 50% on the recharge time compared to using slower 1A adapters. Design is just as important as function which is why the 20000mAh External Battery features smoothed, curved edges. To make things convenient and to minimize tangled wires, all three USB ports are grouped together for easy access. When dealing with power, safety is paramount. To keep the charger and your devices secure, enjoy four different safeguards, which include voltage surge, over charge/discharge, and high temperature protections. The AC adapter is Not included in the package. Please don’t hesitate to contact us if you need any help or have any concern about the product. We will provide in-time and efficient solution. Portable Charger for Rapid Charge of iPhones, Androids, iPad, Power Bank with 2 USB-Ports,10400 mAh, LED Digital Display, Flashlight,Brushed-Metal Blue; Save the Day When a Cell Phone Goes Dead!